A library card issued at any one of our Libraries entitles you to use the resources and services available at all the librariesopens a new window in the Peninsula Library System. Please be aware that remote use of some online resources is limited to card holders of the subscribing Library. If you live anywhere in San Mateo County, applying for a library card is as simple as applying online. Your new library card will be available at your local library or, if selected, mailed to you within 3 business days. On your first trip to the Library, please bring a picture I.D. with your current address. If you are under 18, you will need to come with a parent or guardian. If you live outside of San Mateo County but in California, you may get a card by coming into any San Mateo County Library. San Mateo County Libraries have eliminated daily late fees for materials checked out to children and teens effective July 1, 2016. In honor of this policy change, we partnered with four amazing California-based artists and illustrators (Lisa Brownopens a new window, Joe Cepedaopens a new window, Alina Chauopens a new window, and Christian Robinsonopens a new window) to create some new beautifully designed youth library cards for children and teens to choose from. Visit one of our community libraries in person or applying online for your youth library card today. San Mateo County Libraries offer a special Teacher Card for teachers, home school educators or day care providers who live or work in our service area (see list of participating libraries) and who want a separate library card for classroom use only. 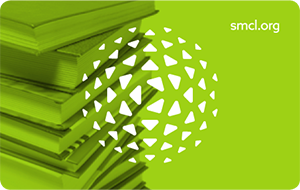 No fines fees on SMCL materials (you will be responsible for lost or damaged items). Longer loans on materials used in the classroom (excludes holiday and high demand material). Teacher Card library records to help keep classroom use materials separate from personal use items. If interested, please visit your local library. We will send you an email when items placed on hold are ready to pick up, or if your items are overdue. To set up this service, log in to your San Mateo County Libraries account. Click MY Account and then My Settings. Under Contact Information click on Show your contact information. Enter your email address in the box marked Email Address and click on the Save Changes button. You will now get your notices by email. SMCL is pleased to offer the convenience of notices by text message powered by Shoutbomb. Instead of receiving paper, phone, or email reminders, library notifications can now be sent via text message. To register for this service, simply send a text message with the keyword SIGNUP to pls@shoutbomb.com and answer a few simple questions. Once the registration process has been completed, all of the features, Auto-Renewal, Holds and Late Fee notices are turned on.